Environmental watchdog Paul Brady, who contributes to the website RespectMyPlanet.org, is leery of this bold new technology known as hydraulic fracturing, or fracking, and its potential effects on local watersheds. But Brady doesn’t think fracking should be banned outright, he told me on a gray March day as we toured various frack well sites around Kalkaska County. “If you ban fracking, you’d stop oil and gas in Michigan, and put 100,000 people out of work,” he said. Brady’s views reflect those of many in the Michigan environmental community who favor a more pragmatic approach to monitoring and regulating the activity. At the corner of US-131 and M-72, in the heart of the town of Kalkaska, we pass several trucks owned by local contractors that are hauling supplies and equipment for the energy giants Encana and Halliburton. 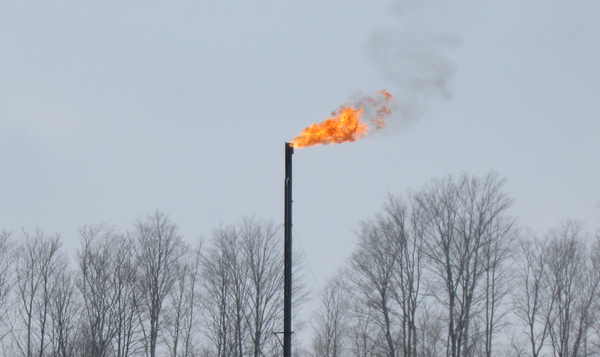 If Michigan voters were to pass a ban on fracking, those multinational oil and gas corporations would leave town and pull the rug out from under local subcontractors, Brady said. Local jobs tied to the oil and gas industry have surged over the past decade as Kalkaska County landed on the map of fracking companies like Encana, which by its own estimate has invested more than $230 million and created hundreds of jobs in Michigan since 2009. According to figures supplied by the Northwest Michigan Council of Governments, Kalkaska County-based jobs in the mining, quarrying, and oil and gas extraction industry ballooned from 237 in 2003, to 541 last year – a 10-year increase of 128 percent. Government was the only field to employ more Kalkaskans in 2013. According to the industry group America’s Natural Gas Alliance, shale gas from fracking accounted for just 27 percent of total U.S. natural gas production in 2010. By 2015 that figure will increase to 43 percent, and hit 60 percent by 2035 while creating one million new U.S. jobs. In Kalkaska County, the average worker in the oil and gas field last year made over $64,000 in wages, a high mark for a rural county where unemployment tops 10 percent. Perhaps most telling of all, Kalkaska boasted more than 8 percent of all oil and gas jobs in Michigan, though the county has less than 0.2 percent of the state’s population. I'm glad the people make good salaries. They will need the money when their water wells become contaminated and their health deteriorates. Fracking is a deadly method of extraction. We will pay a price for our foolishness. ANGA predicts US natural gas production will increase, and create over a million new US jobs by 2035. Everyone else knows that as that happens, the planet and country will be overwhelmed with irreversible climate change. The threat of gas to climate is far greater than the threat to water. Michigan must do its part. Leave hydrocarbons in the ground. State law currently requires DEQ regulators to "foster" the oil-gas industry "favorably" and "maximize" oil-gas production. An added benefit to the ballot initiative for a horizontal frack ban is repeal of that policy. See the language at http://letsbanfracking.org . We will collect signatures in summer 2015 for the 2016 ballot. Let's move forward. With the social and political will, their can be jobs in alternative energy. With climate change, we need to do everything we can to keep the oil and gas in the ground, Right now the price for producing solar energy is cheaper than producing natural gas.